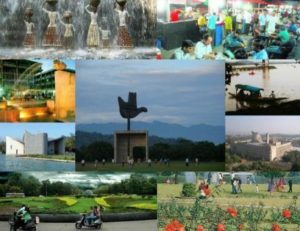 Chandigarh nestles in a picturesque setting at the foot of the panoramic Siwalik Hills of outer Himalaya. The city is bounded by two seasonal rivulets of Sukhna choe in the East and the Patiali choe in the West. Natural features, thus define the limits of the city on three sides while the open landtowards the South leaves scope for its future expansion. The city covers an area of 114 sq. km. and has a population of about 12 lakh. It is directlyconnected to the capital city, New Delhi by air, land and rail and with practically all towns of Punjab, Haryana and Himachal Pradesh by road and rail.The altitude of Chandigarh is 304-365 m above M.S.L. Its climate is sub-tropical and sub-humid. The city enjoys all the three major seasons ofnorthern India viz. the summer season, the rainy season and the winter season. These are interspersed by two transitional seasons viz. the autumnseason and the spring season. Chandigarh has an annual rainfall of 108 cm, 75 per cent of which is concentrated in 30 days during the months ofJuly- September. The temperature may go as high as 45°C in day time around the middle of June and declines to near freezing point on some nights in January. Representative of modern architecture and town planning, the city enjoys the popular epithet ‘The City Beautiful’. In the words of Norma Evenson, “it’s very conception is like a futuristic poem, a hymn to technology, to speed and movement, to a man-made world of vast dimensions, flooded with light and opening limitless vistas”. The history of Chandigarh begins with the partition of India in 1947. The western part of the State of Punjab along with the capital, Lahore, became apart of Pakistan. For a while, the Government of East Punjab functioned at Jalandhar but there was not enough office accommodation. The capital was moved to Shimla as a make-shift arrangement. Several existing towns put forward their claim to be made the new capital of Punjab. It was thought, however, that it would be cheaper and simpler to build an entirely new town than to modify an old one. After an aerial survey, a site was selected which was roughly located at the centre of the erstwhile Punjab State. This was close to the hills and had other advantages such as the: possibility of a rail link, the fertility of the soil, an abundant supply of potable underground’ water, the gradual slope of the land towards southwest which makes drainage easy and last but not the least, the magnificent backdrop of the Himalayas. The new capital wasnamed after the ancient temple of goddess ‘Chandi’ which is situated at a distance of about 11 km from the city. 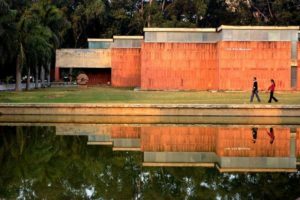 Chandigarh is a manifest of realization of planning fancies of Le Corbusier who opined “an inner law should animate a work created by a humanbeing.” Rightly, thus the city has been visualized as a single organism. Its commanding head is represented by the Capitol Complex, comprising three magnificent buildings -the Secretariat, the High Court and the Assembly Hall with Open Hand Monument standing majestically amidst them; its heart by the Commercial Centre; its brain and intellectual centre by the University, the P.G.I., the Engineering College, the Museum and Art Gallery; and its hand by the industrial area. Such an organic approach to the planning of a town is always meaningful in terms of life. Another highlight of the plan of the city is its rationally conceived and beautifully designed road system. The pattern as a whole is gridiron but the network is composed of seven types of roads, known as ‘Seven Vs’ differentiated on the basis of nature and speed of traffic these are expected to carry. Again, borrowing his analogy from biological field, Le Corbusier said, “The seven Vs act in the town plan as the blood stream, the lymph system and the respiratory system act in biology. These are no longer sinister instruments of death, but become an organised hierarchy of roads which can bring modern traffic circulation under control.” The spacious parks, gardens and playgrounds are like lungs in the body of the city. The most notable among the park areas is the leisure Valley running through the middle of the city from North to South. Within this valley is located the picturesque Rose Garden, formally known as Zakir Garden. 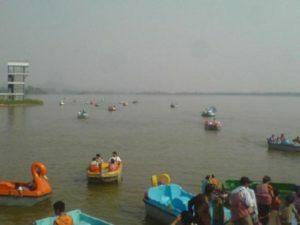 Another recreation site is lovely Sukhna Lake, which has been artificially built by damming a rivulet of the same name. 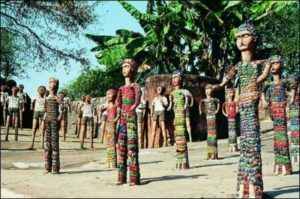 Chandigarh’s well-known Rock Garden beautifully displays the objects made from broken crockery and glass pieces. Here waste materials have been used to carve out natural sceneries. Plaza in Sector 17 is the city’s biggest shopping centre. Besides, Chandigarh has extensive sports facilities with stadium for almost every sport. Moghul style are just 22 km from Chandigarh on Chandigarh-Shimla Highway. Not far off are the beautiful hill stations of Kasauli, Chail and Shimla in Himachal Pradesh. The functional life of the city is no longer restricted to administration. It has emerged as a prominent educational centre with its renowned University and a variety of professional and other institutions. Moreover, it is not without its industrial activity. The industrial area accommodates a large number of units manufacturing a variety of goods such as electric meters, hosiery needles, wool-tops, cast-iron pipes, electrical goods, dyestuff, chemicals etc. Interestingly, industries in Chandigarh are smokeless. In addition, two urban industrial estates of Panchkula (Haryana), and Mohali (Punjab), are developed on the periphery of the city. Chandigarh has something to offer to everyone. To its residents, it is a paradise in Urban living providing maximum facilities of residence, work and play. To a town planner, it is an opportunity and a challenge, while to an academician; it is a stimulating field of research. To a visitor, it unfolds a scene of beauty inherent in the architecture of its buildings, layout of its roads, splendor of its structures -like the Secretariat, the High Court, the Assembly Hall and the Museum, serenity of its Lake, profile of its Leisure Valley, gaiety of its Rose Garden, craftsmanship of Rock Garden, evening life of the City Centre, and sublimity of the University Campus.